Memory foam mattress toppers can be a good alternative for people that don’t want to go all in with a memory foam mattress. The topper is just as comfortable and offers a lot of long-term benefits to those that want to try out the industry. They don’t cost a lot of money, and there are a lot of brands to choose from that will give you a quality night’s sleep when it counts. Here is a list of some of the best brands on the market, and why you should pick your memory foam mattress carefully. 12 What Are Memory Foam Toppers Made Out Of? 15 Are Memory Foam Toppers Worth It? Available in twin, full, queen and king, this particular high priced mattress topper doesn’t have a name behind it but does have a lot of positive reviews. It is a great alternative to those that don’t have the funds to purchase a more expensive brand yet still want matching quality. If you are close to replacing your current mattress, then this memory foam mattress topper will come in handy and breathe new life into your bed, and all without throwing away your current set. Purchasing this topper will allow everyone to either buy time until they get a memory foam mattress or just keep what they currently have and enjoy the rejuvenated feel. 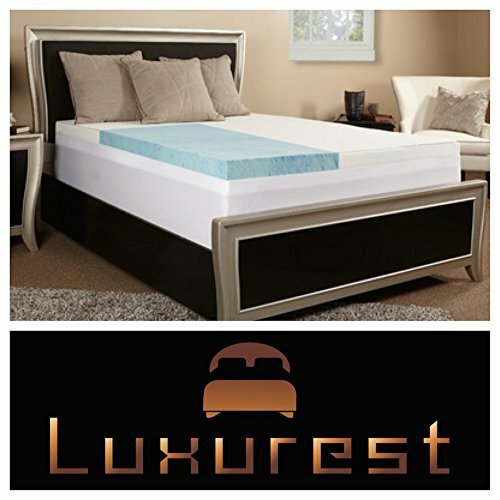 Luxurest has infused this topper with gel, so you get a cooling feel throughout the night even in humid climates. Made with 4 inches of dense memory foam, everything underneath it will just be used for support. This is great in situations where you have a firm mattress but are more inclined to sleep better on something in the middle firmness area. 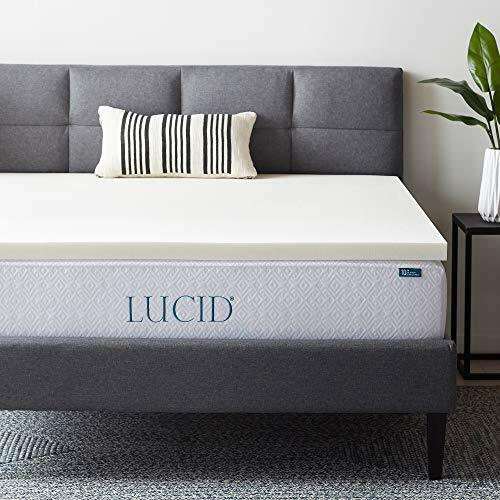 One of the best-selling items in Luxurest’s inventory and made in the USA, this is a great choice on the list if you want a thick gel memory foam with good quality. 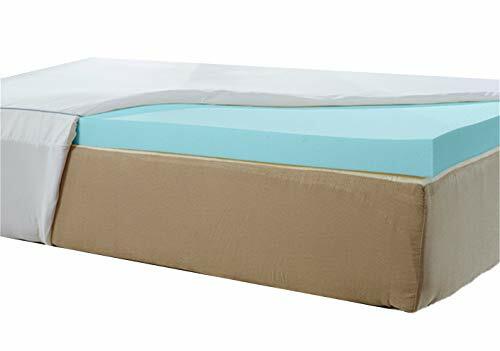 The branded Sleep Innovations 4-Inch dual layer mattress topper has been a favorite of many people for years, and is one of the lower cost items on this list. It is available in twin, full, queen, king and California king. In particular, California king is hard to find in mattress toppers, making this one of the more exclusive toppers on the list. Sleep Innovations went all out and made this gel masterpiece feel like a cloud with a mix of 2 inches of gel memory foam and 2 inches of fiber-fill. This affords the topper with the best mix of soft and firm, with enough support to where the mattress it is put on top of will not even be a factor. They’ve included a snug-fit cover that is pretty durable to those with pets, and can be taken off and washed before and after it gets dingy. With the included 10 year limited warranty, this topper can do no wrong and is one of the best on the list. Sleep Innovations has created a top solutions for sleepers of all types who want a reliable but comfortable memory foam topper. Third on the list is once again Luxurest with their 3 inch model, which functions the same as the first on the list but for a different type of sleeper. As a high priced option it is exclusively available in queen and king only, and is one of the higher priced options on the list. So why would people pay so much for this particular model? It’s all about the dense gel infused memory foam they use. Luxurest went all out with this model and made it for people that suffer from chronic back pain, arthritis, joint pain and fatigue. Not only will you get a good night’s rest with this model but the topper itself will mold to your body as it is the ultra-soft model. Fluffy is the best way to describe how the material feels, and a lot of people will prefer it to the mid/firm models. For buyers that are interested, the density is 3.5 pounds and perfect for the two sizes available. Soft and perfect, Luxurest made a great decision with this 3 inch model of their brand. Either a huge hit or a miss, the Sleep Joy 2 inch ViscO2 is one of the most talked about budget memory foam toppers in the business. There are some real die-hard fans and detractors to this underrated topper. It is available in twin, twin xl, full, queen, king and the much loved California king. Unlike a lot of the other toppers on the list, this one does not have gel infused memory foam. Instead they use an in-house breathable material that increases airflow and provides the same cooling effect as gel memory foam. Because of the way that it is made, the environment it is used in tends to be more hygienic. This is a big plus for people that suffer with allergies and want to ease into trying something new. There are no harmful residues or materials that retain bad odors, so it is a really nice topper to pop out for guests when you’re in a pinch. Sleep Joy is also a green company, so they have enhanced the materials with plant based ingredients. Low priced and low impact, this is an underrated topper that everyone should give a second look. If the brand name sounds familiar then that is because Lucid is very good at their craft. As one of the lowest priced options on the list, it is also comes with one of the best warranties at 3 years. It’s also another topper that isn’t gel based and instead uses different materials for a green buy. Sizes available are Twin, Twin XL, Full, RV/Short Queen, Olympic Queen, King and California King. As one of the thinnest toppers on the list, Lucid had to bring their A game to compete with the others. This particular topper focuses on pressure relief and keeping the body cool. It is CertiPUR-US certified and uses open cell technology to mold itself to whoever is on it. The actual feel of it is hard to describe, but sits somewhere in the middle of firm and soft. For anyone on the fence about how it feels or the density, most users have described it as more firm than it is soft. Lucid is one of the best in the business and this is a pretty good topper. Giving just enough to make it worth a look, sleepers will no doubt find this a comfortable buy. Mid-priced and a bit of a bargain, the Beautyrest 3 inch topper comes with a waterproof cover that is better than most. There is also a 5 year limited manufacturer warranty that really holds up well if the quality decides to decline. The timing of the warranty is about right and should satisfy those that are a bit afraid to try something new. But the product is pretty anti everything, including resistant to dust mites and labeled as hypoallergenic and antimicrobial. Like all the other toppers on the list it has a cooling effect that draws heat away from your body while you sleep. The Beautyrest handles this feature better than most, and seems to have better materials all around. They use a textured side for air flow while depending on the included polyester knit fabric cover to balance out the entire package. Everything feels comfortable, clean and dry. Beautyrest doesn’t get a lot of mention in the industry but that will soon change. This is a top item on the list, and may even sneak into the top three for anyone looking at California King, full, king, queen and twin sizes. This low priced Visco comes in Twin XL, Queen, King and California King. Made for sleepers that tend to not get comfortable once they lay down, the topper can slow down or completely stop tossing and turning. Using visco-elastic memory foam, sleepers will fall in love with the way it conforms to their bodies almost immediately after touching it. Pressure points are automatically targeted and your entire body becomes relieved after a few nights of sleeping on this topper. The way it regulates temperature is about the same as the others, using an open cell foam to get everything just right. With this particular topper, rather than instantly making you cool, it instead finds the perfect temperature to make sleeping perfect. So sleepers won’t be too hot or too cold, leading to a much more comfortable rest. Purchasers that need a fit for a short queen will also find that cutting it to fit is not as hard as other toppers. Visco may not be the biggest name on the list but it has a really good showing with this product. A great topper, this one is well worth your money. Easily one of the best on the list, the Natures Sleep Thick AirCool IQ comes in Twin XL, California King, Full, King, Queen and Twin. It also comes bundled with a quality polyester microfiber fitted cover that is soft to the touch. At 3 inches thick, this CertiPUR-US topper has 3.25 pounds of AirCool IQ gel inside of it. So even though the topper is listed as 3 inches, it performs like a 5 inch topper. Despite everything under the hood it still maintains a remarkably light feel. Similar to open cell technology, Natures Sleep uses lighter foam visco-eslastic technology that is made to react to the sleeper’s body temperature. By being thick and still breathable, it is one of the few toppers on the list that can actually perform as a mattress. The topper is really that good, and will guarantee a much better night of sleep after using it for one night. Buyers should expect a cooler and more comfortable sleep with this purchase and all for about a medium price. Top two of the entire list, this is the Mercedes Benz of toppers. The award for the topper with the most options goes to this model, and considering the high price it’s no wonder. It is available as twin, twin X-large, full, queen, California king and king. This topper can improve any bad mattress you have and make it feel like it is brand new again, even if your old mattress is sagging. 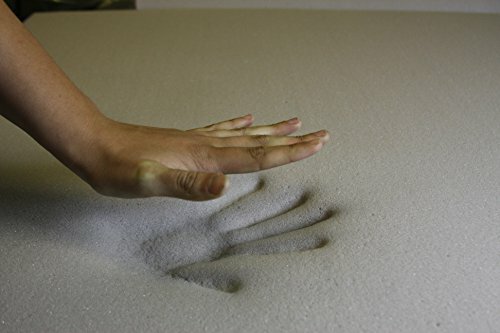 Memory Foam Solutions has made this particular topper firm and thick, with 4 pounds of extra supportive memory foam. It will still conform to your body as well as a softer material. Made in the USA, it exceeds PURGreen certification standards. It is as close to a gel topper feel that you can get without actually getting a gel memory foam, and is just as comfortable. 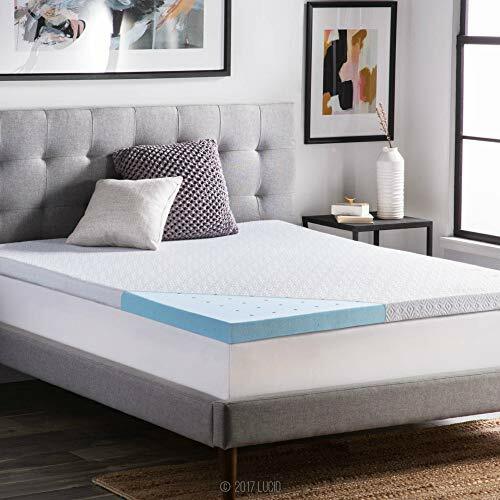 It has consistently scored high marks across the board from both reviewers and critics, which is hard to do when you’re competing against gel memory foam toppers. Buyers that are looking for a topper that isn’t gel but has the same feel will end up settling on this model. It is as close to the real thing as you can get, and in many ways is twice as comfortable. The best on the list goes to the last, and Lucid knocked it out of the park with this one. 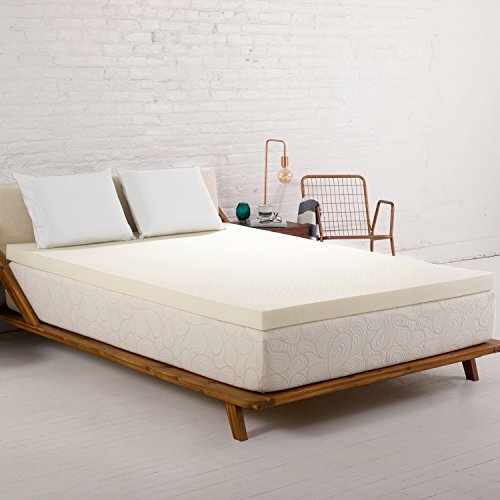 Medium priced but having all of the bells and whistles, they took a 2.5 gel infused mattress topper and threw in a high quality bamboo cover. This pleases both the gel loving buyers and the green buyers. It is available in full xl, twin xl, California king, full, king, queen and twin. Keeping everything that lays on it cool, the topper transfers heat from the body and away to keep you from waking up in a cold sweat. With a removable bamboo cover that is made to keep away unwanted materials, users can wash it as many times as they want. It also comes packed with a three year warranty, and is more than enough to keep the most stubborn user happy. This is about everything you would want in a memory foam topper and is the right firmness, price and extras to keep you satisfied for years. Easily the best memory foam topper available, customers will continue to be amazed by what this topper has to offer. Memory foam toppers go on top of your current bed and can be used for a variety of different things. The main reason people buy toppers is to upgrade their bed without coming hundreds, or even thousands out of pocket. The toppers on the current list are the best of the best and in many cases will not only renew your current setup, it will make it feel like a brand new bed. Toppers are generally low priced and easy to obtain, but have some of the best materials on the market. What Are Memory Foam Toppers Made Out Of? There are two main categories to this list, although there exists plenty more. But the two main heavyweights are gel memory foam and ‘specialized’ memory foam. These are the two most common you will run across, with the specialized coming in a lot of flavors. One isn’t better than the other, and they all come with their strengths and weaknesses. By looking at the description of the product you can get a better idea of where your interests may lie with a topper. Gel memory foams are without a doubt the most comfortable material you can get. They have the most breathability, and mold to your body while adding a cooling effect. One of the big things about gel memory foam is that their density plays a big role in how comfortable it will be for each individual user. A firm gel topper may not be comfortable to someone that wants a soft one. Unlike regular memory foam, the density measurements are as accurate as possible, so if you know your math then you know exactly how it will feel before even laying on it. Specialized memory foam doesn’t have any gel infused into it, and varies in material based on the brand. The one thing they all have in common is that they are usually green. Anyone with allergies will prefer specialized memory foam toppers over gel infused. They are hypoallergenic, dirt and dust resistant and in some cases better priced per pound. And since the material is a little cheaper to make, you’ll also run into generous inches when it comes to the size. The downside is that they are not as comfortable as a gel memory foam, although close. They also don’t have 100% accurate density measurements so a little trial and error is necessary for perfectionists. Even if everyone’s situation is different, every household should have a memory foam topper of any type. You never know when your bed is going to give out on you, and even if you’re under warranty it can be a pain to sleep on a bad mattress as you wait for a new delivery. Toppers can function as a temporary stop gap until you get your new mattress, and it will feel like you’re not missing anything at all. They also work fantastic for sleepovers- just pull it out from storage and lay it on the floor to get the most comfortable guest bed in the world. This is helpful in places where you don’t have an extra bed or where space is limited. And of course the main reason for a topper is for people that don’t want to spend a whole lot of money on a brand new mattress. For less than 1/10 the price of a new quality mattress you can get as close a feeling as possible, which is really insane if you think about it. Toppers aren’t just stop gap solutions for many people, and they are used to improve a lot of bad mattresses or just plain uncomfortable ones. Even if your current mattress is comfortable it may not be the right fit for you. There are millions of people daily that don’t get a good night’s rest and wake up sweating, one of the worst feelings in the world. And there are people that sleep all through the night but still wake up tired and aching. This can be fixed with the natural therapeutic powers of memory foam, in any iteration. Memory foam toppers breath and take away heat from your body while you sleep, keeping your temperatures comfortable throughout the night. This is most beneficial in humid areas or in very hot climates. Joint and muscle pain is relived as you sleep because memory foam conforms to your body. Rather than putting your body in an uncomfortable position for eight hours straight, memory foam allows you to sleep in a natural laying position, healing your aches as you sleep (and not worsening them!). This revolutionary technology has been used by NASA for years, so is the real deal. Are Memory Foam Toppers Worth It? Absolutely! All of the listed toppers are in a great price range, and are a drop in the bucket compared to buying a full on mattress. For some people this may even be their first foray into memory foam, and serves as a safe gateway to learn about the materials used. Don’t hesitate when it comes to purchasing a memory foam mattress topper. The prices are too good, and mattress prices aren’t going down anytime soon. If you want a good night sleep and the quality of an expensive mattress without the hit to the bank account, then toppers are the way to go. What Does Make Foam Have Memory? How to Look After Your Memory Foam Mattress? Can Infants Sleep on Memory Foam? How to Choose the Right Density For Your Mattress?